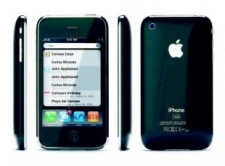 A year after the launch of the Apple iPhone 3G, the 3GS arrived and some critics claimed that the new model was seemingly identical to the 3G from all exterior observations, except for the iPhone lettering being reflective sliver as the Apple logo. However, consumers soon found that despite very similar outward appearances there were some definite improvements with this upgrade. The screen itself of the 3GS is improved with a smear free screen. The addition of Spotlight makes navigating the phone much easier, allowing users to search throughout the phone, including the any apps. The downside is that once the item is located it cannot be directly accessed from the search feature – the user simply knows where to locate it. As popularity of iTunes and the App Store grows, so do the offerings of music and videos to download. Two issues impeding users from enjoying these full capabilities are that the battery life is quickly drained when using music or videos and Apple stopped producing 3GS models with more than 8GB of memory. A major upgrade with the iPhone 3GS in regards to videos has to do with the new camera upgrade to one with video recording capabilities. Unfortunately the upgrade to a 3MP camera is not a sufficient enough upgrade to produce high quality videos, but it does record up to 30 frames/second and includes an autofocus feature where users tap to the screen to focus. Perhaps one of the most favorable improvements with the 3GS is the processor. The “S” apparently stands for speed and users appreciate the ability to upgrade to 32GB of memory and access information much faster, with Apple claiming the 3Gs is twice as fast as its predecessor. Unfortunately the issue of battery life was apparently not a priority an areas of improvement when moving from the 3G to the 3GS. The iPhone 3GS comes with a digital compass, a benefit to those relying on their phones for GPS and recreational activities. Additional software available for the 3GS continues to grow as applications become available in the App Store. Users also appreciate the new copy and paste feature that many felt was lacking with the iPhone 3G. This helps turn this phone into a mini word processor of sorts, allowing users to grab specific points of text and paste them into other documents. Even though many consumers weren’t exactly begging for the upgrade, Apple added voice control to the 3GS. This allows users to control their devices through the Voice Control application. Voice control in the 3GS, however, is fairly limited to dialling numbers for calls and controlling music or other basic commands. Whether or not you feel that the differences between the iPhone 3 and the iPhone 3G were significant, it doesn’t change the fact that the best online casinos for both devices remain the same. All of the cutting edge casinos have ensured that their mobile casino software continues to be fully compatible with both the 3 and the 3G, so the experts here at MacCasino.net recommend the same operators for both Apple smartphones. The best U.S.A. mobile casino for older iPhones has always been the Bovada Casino because they have employed a large team of skilled developers since they launched in 1994. They have always been at the forefront of technology for mobile devices, especially those released by Apple Inc., so if you live in the United States and are looking for solid mobile casino software, they are definitely the choice for you. We here at MacCasino.net have had nothing but good experiences at the 32Red Casino when playing on mobile devices. It’s not just because they have fantastic software, it’s also because they have great loyalty programs, bonuses, and a stellar reputation. We wholeheartedly recommend them to any online casino players in England, Wales, and Scotland. The best Canadian casino for both the iPhone 3G and iPhone 3GS is the Bodog Casino, who have been giving Canadians white glove VIP treatment since 1994. We are huge fans of their mobile casino software which never lags or freezes, which is especially important when servicing the world’s second largest country. As long as you can receive a signal from your cellular service provider, you can place a wager at the Bodog Casino.